Hurricane Irene did not spare Sgt. 1st Class Marco Chavez. The rising floodwaters swept into the New Jersey Army National Guard Soldier's home in Fairfield, causing massive damage and forcing the evacuation of his family. But when the storm hit, Chavez was among the nearly 2,400 Citizen Soldiers and Airmen who reported for duty to protect the property, safety and lives of their fellow New Jerseyeans. When Gov. 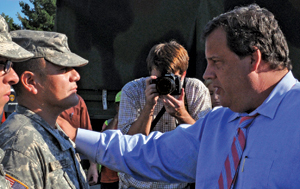 Chris Christie met Chavez several days later, the 46-year-old Iraq veteran – and his 20-year-old son, Pfc. Angel Chavez – were still with the mission to help friends and neighbors recover from the devastating storm. When asked why, Chavez simply replied: "This is what we do. This is where we need to be right now." The most remarkable thing about the National Guard's largest domestic mobilization in more than 30 years was that Chavez's story is not uncommon at all. Scores of Soldiers and Airmen from Cape May to Riverdale left their homes and families in a time of crisis. They are part of an all-volunteer force that reflexively puts the needs of their communities' before their own. Countless examples of selfless sacrifice formed the backbone of the New Jersey National Guard's unprecedented response to a storm Gov. Christie described as a 100 year event. As the state's military first responders, Soldiers and Airmen rescued 543 residents imperiled by rising water and conducted hundreds of missions in direct support of civilian authorities on assignments ranging from rescues, to safeguarding property to transporting relief supplies. Young men and women logged thousands of miles in high-wheeled vehicles on treacherous roads with few incidents and no injuries. Helicopter pilots and crews flew dozens of missions to gauge where to best marshal resources. Soldiers and Airmen also played key roles in the operation of the state's emergency evacuation shelters. To get a fuller appreciation of the National Guard response to the storm, remember that as devastating as this storm was, the initial predictions called for Category II hurricane packing 115 mile winds to make landfall at Cape May and to head due north through the center of the state. to command federal active-duty troops had they been needed here for additional disaster relief. In the hours after the storm made landfall, it became clear Hurricane Irene's greatest threat would not be destructive winds, but epic flooding in Central and Northern New Jersey. The National Guard responded to the shifting threat by rapidly reconsolidating Soldiers, Airmen and equipment in Somerset, Passaic, Essex and Bergen counties before the hurricane officially exited New Jersey and long before rivers reached flood stage. From there, it was a textbook example of the National Guard responding to requests for assistance from its partners at the Office of Emergency Management and the State Police. 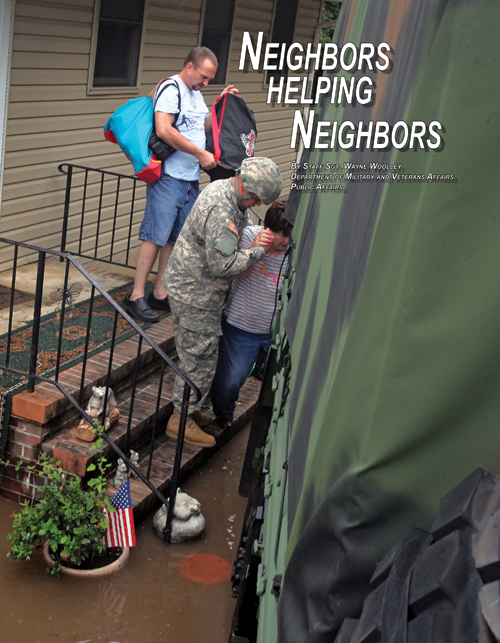 As the floodwaters receded, the National Guard began its drawdown at a pace commensurate with the remaining threat. The rationale was simple. The overall government emergency response required by storms of that magnitude is expensive. Although the Soldiers and Airmen of the National Guard are already a great value to the taxpayer because of their part-time pay structure, the National Guard leadership team understood the need to be good financial stewards. The National Guard's response to Hurricane Irene required intricate planning, preparation for multiple contingencies and a complicated analysis and reaction to an emerging threat. Even though Soldiers and Airmen drove thousands of miles without incident, the chaotic nature of the storm and an aggressive push by Soldiers led to an incident in which two vehicles became stranded in floodwaters in Manville. Video images of this episode were posted on a social networking site and received coverage from some news outlets. A commanders' inquiry and safety investigation was undertaken in response. But in that case, as in all the hundreds of other missions successfully completed by the National Guard, the Soldiers and Airmen made an aggressive push in response to one of the nastiest storms in memory in a determined effort to save lives and protect property. Let's remember two other things that happened during Hurricane Irene that didn't make the news. The first came less than 72 hours after the storm landed, when a large group of Soldiers demonstrated the versatility of today's National Guard, boarding a plane at Joint Base McGuire-Dix-Lakehurst to begin a one-year deployment in Iraq and Kuwait. They joined more than 15,000 other New Jersey National Guard troops who have contributed to our nation's defense by serving under combatant commanders around the globe over the past decade. The second came later that day, in Manville, when a number of Soldiers joined Gov. Christie at a town hall event at a VFW Post surrounded by waist-high water. When this gathering of residents, emergency workers and elected officials spotted the uniforms, a spontaneous chant broke out. It was: "National Guard, National Guard." Folks in that VFW Hall that day recognized that the New Jersey National Guard is the Hometown Team. They are their friends and neighbors who volunteered to serve and can be counted on to step up when they are needed most.